Few issues today are as important for American civil society as maintaining its commitment to religious pluralism and tolerance. Troubled by the rise of increasingly polarizing religious rhetoric in America, the Justice and Society Program undertook to examine the issue in March 2011 at a day-long conference, “America the Inclusive,” in partnership with Chicago-based Interfaith Youth Core. Encouraged by the high level of enthusiasm exhibited by participants in the initial conference, the Justice and Society Program launched the Inclusive America Project (IAP), a high-level nonpartisan project focusing on five key sectors: youth development organizations, higher education, media, religiously affiliated organizations, and government agencies. 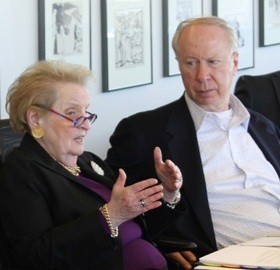 With former Secretary of State Madeleine Albright and Harvard Kennedy School professor David Gergen serving as co-chairs, IAP brought together a distinguished panel of leaders in these five sectors for full-day meetings at the Aspen Institute headquarters in December 2012 and April 2013. Panelists collaborated to author a white paper on proven strategies to increase respect for diverse religious identities in the public sphere, foster positive interfaith interactions, and form productive partnerships among people of different faiths in the service of the common good. The report, titled Principled Pluralism, was discussed in two events at the Aspen Ideas Festival (full video from both events available below!) by Co-Chairs Gergen and Albright, panel members Eboo Patel and Jim Wallis, former ISNA president Ingrid Mattson, and Washington Post columnist E.J. Dionne. The report can be ordered here or accessed in PDF form here. 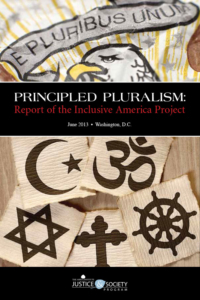 In the months following the publication of Principled Pluralism, IAP promoted the report’s recommendations through various media channels and disseminated more than 1,250 hard copies of the report to key individuals and organizations across the US. During the first half of 2014, IAP conducted parallel studies with Boys & Girls Clubs of America (BGCA) and The Y of the USA to assess how growing religious diversity is affecting their programming. IAP also held public discussions about religious diversity at Calvin College (Grand Rapids, MI) on April 24, 2014 and Wheaton College (Wheaton, IL) on April 29, 2014. 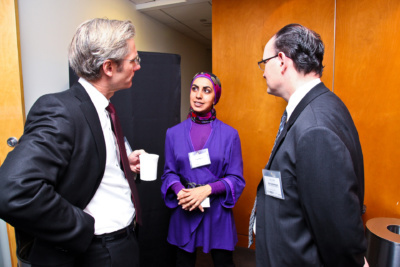 In May 2015, IAP released Interfaith Engagement in West Michigan, a detailed study of interfaith efforts in the region over the past 30 years. This study contains an introduction to the contemorary interfaith movement in the US; a brief history of the interfaith movement in West Michigan; and an analysis containing insights about interfaith organizing gleaned from the West Michigan experience. IAP is also working with the George Washington Institute for Religious Freedom to develop a resource for youth development professionals that will explore specific challenges and opportunities presented by religious diversity through actual scenarios encountered by BGCA and Y staff. For thoughts on the relationship of the millennial generation to religious pluralism, here is a recent contribution by Joseph DeMott, former Project Manager of the Aspen Institute’s Inclusive America Project. Furthering the discussion on principled pluralism, Justice & Society Program Executive Director Meryl Chertoff spoke at the Chautauqua Institution on June 29th, 2015. Read her full remarks here. For coverage of the talk, please see here and here.